UNITED NATIONS, New York, 16 August 2017– The President of the United Nations General Assembly, H.E. Mr. Peter Thomson completed his visit to Hong Kong today. While in Hong Kong, President Thomson met with Government officials, diplomats, professors of Ocean science and environmental actors to discuss follow-up action from The Ocean Conference held at the UN in June 2017. In his meeting with H.E. Mrs. Carrie Lam, Chief Executive of the Hong Kong Special Administrative Region (HKSAR), discussions covered the implementation of the 2030 Sustainable Development Agenda, with emphasis on HKSAR’s environmental issues. President Thomson congratulated the Chief Executive for HKSAR’s steady progress in implementation of the Sustainable Development Goals. Chief Executive Lam expressed readiness of the HKSAR to share its experience and expertise in relation to marine protected areas, sustainable cities, energy and environmental conservation. The President met also with the Commissioner of the Ministry of Foreign Affairs of the People’s Republic of China in Hong Kong, H.E. Mr. Xie Feng. Their discussions covered the implementation of the 2030 Sustainable Development Agenda and the positive contribution China’s Belt and Road Initiative will make in that regard. Their talks highlighted the critical importance of The Ocean Conference, and the necessity of concerted follow-up action in order the meet the targets of Sustainable Development Goal 14. President Thomson thanked Commissioner Xie for the strong support that China has provided to the UN throughout the 71st Session of UNGA. Today, the President delivered a keynote address at an Ocean luncheon, attended by one hundred participants from the HKSAR’s diplomatic and business communities, academia and other stakeholders. 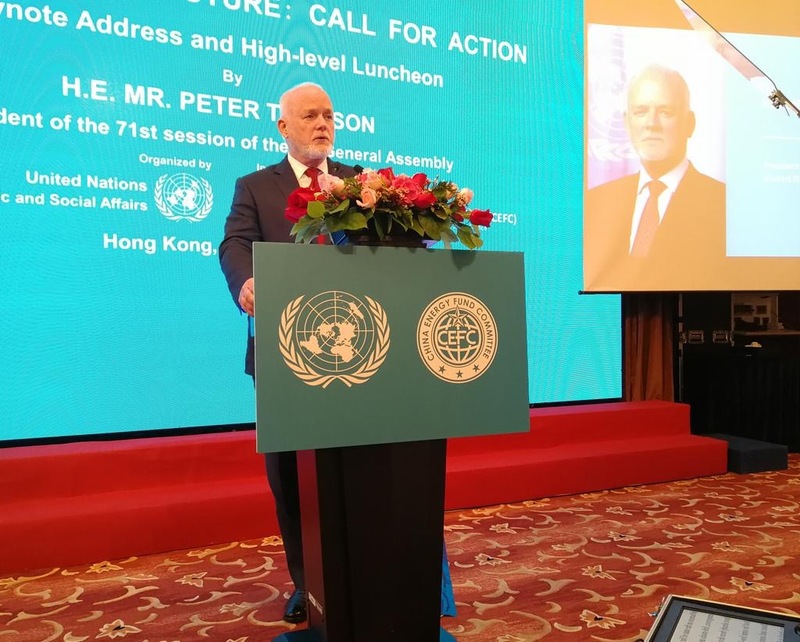 In his address, President Thomson highlighted the three main outcomes of The Ocean Conference: the ambitious political declaration “Our Ocean, our future: Call for Action”; the broad range of innovative solutions expressed during the partnership dialogues; and the nearly 1400 voluntary commitments to Ocean action. “The reality is we have all in one way or another contributed to the decline in the Ocean’s health. But for every human problem there is a human solution. It is therefore incumbent upon us all to take now responsibility for our past behavior, and begin acting decisively to save the health of the Ocean”. While in Hong Kong, President Thomson also held Ocean action meetings with Dr. Ye Jianming, Chairman of China Energy Fund Committee, and Dr Haiwan Zhang, Director General of the Department of International Cooperation of China’s State Ocean Administration. Yesterday, an interactive luncheon was held with marine professors from eight Hong Kong universities for discussions on such critical marine issues as hypoxia, acidification, Ocean warming, and rising sea levels. President Thomson undertook field visits to Hoi Ha Wan Marine Reserve Park to meet with Government and WWF representatives to observe marine conservation and educational activities, as well as to HKSAR’s Ocean Park for briefings on the work carried out by the Ocean Park Conservation Foundation in raising awareness on marine biodiversity, marine pollution and sustainable development. The President’s Hong Kong visit was organized by the UN’s Department of Economic and Social Affairs and represented the first of a series of outreach initiatives to support the implementation of the outcomes of The Ocean Conference.